Alistair MacLeod was a friend to Halifax Public Libraries and we shall miss him very much. Join us as our staff remembers this fine Nova Scotia writer and his work. I went to hear him read from No Great Mischief in 1995 or 1996, long before the book was published. The program room was full and people were standing in the hallway hoping to be able to hear him. He read the opening passages from the book and it was wonderful. He just read so very beautifully. I had the pleasure of chauffeuring Alistair MacLeod around for a day, very early in my career, while he was doing some author visits for the Halifax County Library. At the time, I didn’t really know who he was, but I instantly connected to him as a fellow Cape Bretoner, warmed to his wry humour and gentle manner, and appreciated his very evident keen intelligence. Once I heard his presentation, I immediately resolved to read all his books, and found reflected in them all the dignity and humanity I sensed in him after such a brief encounter. It remains a treasured moment in my career. 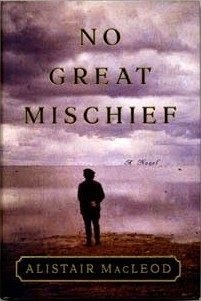 It took Alistair Macleod thirteen years to write No Great Mischief. In the late 90s, before it was published and still an unfinished manuscript, we hosted Alistair MacLeod at the Spring Garden Road Memorial Public Library when came to do a reading from his work in progress. I will never forget seeing the rusty outline of a large paperclip on the first page of this thick pile of paper – a testament to the time he devoted to this book. At that point he had probably been working on the novel for over 10 years. We listened in silence as he read for us, and when he was done, peppered him with questions about when, WHEN, he would finish it. He laughed, and pulled the manuscript together with his rusty paperclip. Island: the complete stories by Alistair Macleod is one of the most beautiful collections of short stories I have ever read. It is honest, heartbreaking and breathtaking at the same time. Alistair MacLeod's writing is as beautiful as Canada's Eastern Shore. 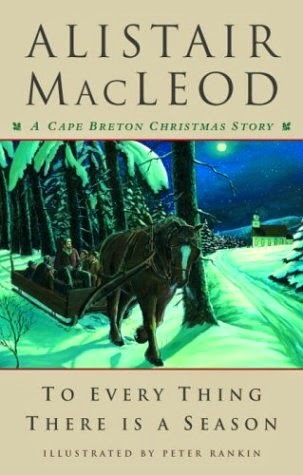 The thing about Alistair MacLeod’s writing that resonates the most with me as a reader and lover of the short story form is his ability to capture all of the pathos and meaning of the story in one beautifully crafted image. 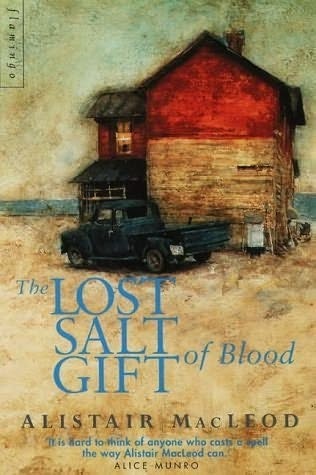 I’m thinking in particular of the image at the end of my absolute favourite story from his collection The Lost Salt Gift of Blood (which is incidentally also my fav. short story collection title EVER), “The Fall” of the husband taking the coral hair combs from his wife’s still coal black hair and it flowing out and blowing in the wind like a horse’s mane in which he buries his face. Such a heart-wrenching and moving image given the heartbreaking decision he had to make to sell the family’s beloved horse Scott and his young son David’s devastating reaction.